Just about everyone has heard of Jökulsárlón, usually simply referred to as the “Glacier Lagoon”. And if you’ve visited Iceland, we’d bet money that you’ve visited this magical place. We can’t ever resist stopping by and have on every one of our trips to Iceland. But, it’s not the only glacier lagoon. In fact, just 30 minutes east of Jökulsárlón is another glacier lagoon. Hidden, tourists zoom by the Heinabergslón Glacier Lagoon in their rush to drive Iceland’s Ring Road and never know an adventure awaits: kayaking the glacier lagoon. Vatnajökull is Iceland’s largest icecap, and it’s also one of the largest in Europe. It actually has 30 different outlet glaciers flowing from the icecap, and in the mid 1900s some glacier lagoons started forming as the glacier tongues retreated from the sea. The most famous and one of the most spectacular sights in all of Iceland is Jökulsárlón, the glacier lagoon that formed off of the Breiðamerkurjökull glacier tongue. It’s impossible to miss as you make your way around Route 1, and worth the drive out to it even if you don’t plan to circle Iceland on the famous Ring Road. But Heinabergslón is located 8 kilometers north-east off of Route 1 down a gravel road. It’s marked by Iceland’s “place of interest” indicator road sign, but nearly every tourist in Iceland blazes right on by never knowing another glacier lagoon with floating icebergs awaits. Jökulsárlón is actually a mix of fresh and salt water from the Atlantic Ocean flowing in to the lagoon, accelerating the melt rate of the icebergs that calve off of the Breiðamerkurjökull glacier tongue. All of that makes the icebergs in Jökulsárlón much more prone to flipping over at any time, and they do flip constantly. Just stand in the pitch dark trying to photograph the Northern Lights at Jökulsárlón, and you’ll hear just how much the ice moves and cracks. It’s a bit eerie when your hearing is heightened because you can’t see anything. 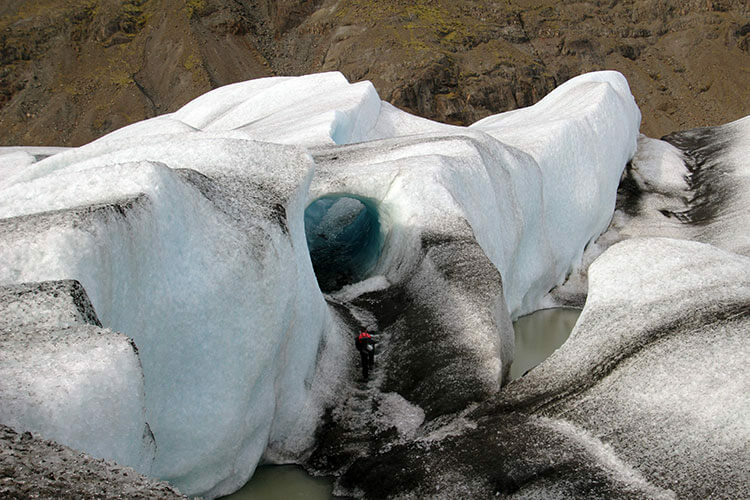 The danger of flipping icebergs is precisely why kayaking tours aren’t offered at Jökulsárlón. Zodiac tours, which let you get fairly close to larger icebergs, are offered, but the zodiac pilots are out on the glacier lagoon constantly to be very well acquainted with the ice. It’s simply not safe to take a group of kayakers, many who will be novices, out among the unstable icebergs at Jökulsárlón. Heinabergslón, however, is a fresh water lagoon with just a river flowing in to it. There’s still a surprising current created by the icebergs and calving Heinabergsjökull glacier tongue, but the icebergs are much more stable with huge bases. Almost like upside down mushrooms floating in the lagoon. The conditions are excellent and safe for kayaking, allowing you to get up close to icebergs in a way you can’t most other places. 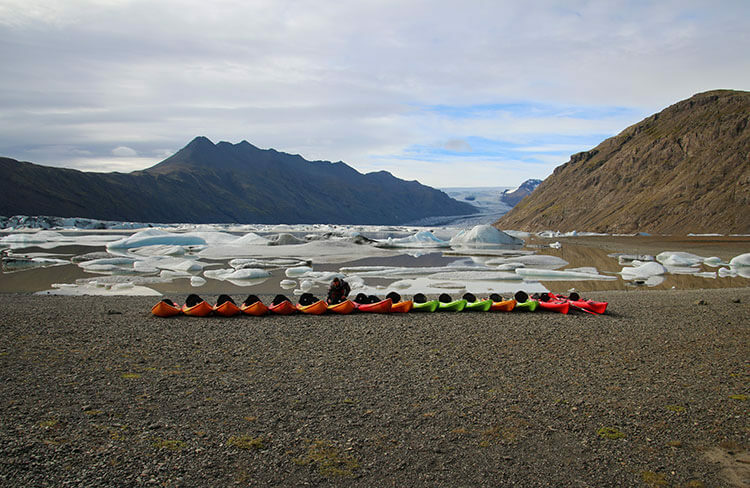 The company Iceguide runs a glacier kayak adventure tour from June through September. We met our Iceguide kayak guide at their base camp at Flatey, one of Iceland’s largest dairy farms (and you can take a peek inside if you like). At the base camp, we were suited up with dry suits, waterproof boots and gloves since the water in the glacier lagoon is just above freezing. Our group piled in to two Super Jeeps for a bit of a bumpy ride the 8 kilometers out to Heinabergslón, which takes around 20 minutes. Once at the glacier lagoon, we finished suiting up in the dry suits by pulling them over our heads and zipping them up. Ladies, make sure your hair is tied back because it’s inevitable that you will lose at least a few strands while pulling a dry suit over your head. 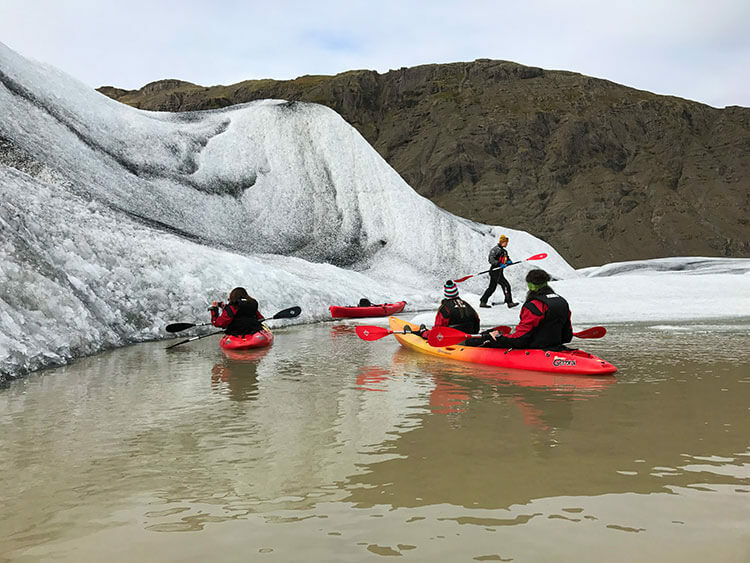 There’s a short 5-minute downhill hike to the glacier lagoon’s shore, where our guides gave us instruction on the proper way to hold the paddles, get in the sit-on-top kayaks and what to do in the unlikely event one of us managed to flip our kayak. Tim and I have kayaked a lot of places, including in the Westfjords in Iceland. But I found it hard and got frustrated quickly with kayaking in the iceberg lagoon. Less than 10% of an iceberg’s mass is visible above the water, and I found myself beached often. I paddled in a single kayak. The pairs in double kayaks definitely had it a bit easier. There were quite a few places where our guides had us line up, then paddle with all our might to get some speed going so our kayaks would glide more easily over ice just below the surface. All that frustration at getting stuck on ice was quickly forgotten as I took in the scenery. We weaved the kayaks between icebergs, sometimes in little channels so narrow we had to paddle single file. Talk about feeling small, as pieces of ice that had calved off the glacier towered all around us. And aside from the odd car that found its way down to the lagoon, we were the only ones for miles. Incredible doesn’t begin to describe it. The best part of the glacier kayak adventure was yet to come. We actually landed on and explored an iceberg. After our guides helped us bring our kayaks securely up on an iceberg, we were given ice grips that slipped easily over our boots so that we could walk around. And our guides used an ice axe to make steps for us on the steeper parts so that no one would slip and fall. The guides scout and try to land on various icebergs, making each kayak adventure tour unique. It’s also a bit more fun for the guides when they’re out on Heinaberg Lagoon so frequently during the season. Can you spot one of our guides chiseling out steps up to the moraine for us? The ice is always changing as the icebergs calve off Heinabergsjökull and then melt down. About a month previously, the guides had found an ice cave. At the time they found it, you couldn’t even stand up straight inside it. Technically a moraine, our guides thought it would probably melt and no longer be a feature of the iceberg within a couple more weeks. We all felt incredibly lucky to walk inside the moraine, look at the cracks that had formed when the glacier itself formed and bask in the soft shades of light from the blue ice. We each had time to pose for a photo inside the moraine, before we had to make our way back to our kayaks. It was sadly time to paddle back toward the Super Jeep’s we’d left on the hill, our time on the Heinabergslón just about up. Iceguide base camp has a limited number of dry bags in both phone size and larger for stashing cameras and few belongings for you to borrow during the tour, though we always suggest packing your own dry bag for Iceland. Even in the Icelandic summer, you want to dress in layers since the wind can be brutally cold and cut right through you. We happened to be blessed with a rather warm (for Iceland) day with almost no breeze. One layer with a long sleeve shirt, waterproof pants and wool socks was plenty under the dry suit for us, since you warm up quite quickly from paddling. You just have to judge based on the weather, and you know how much you warm up from activity. You can leave extra layers in the Super Jeep once you reach the glacier lagoon, and if you think you’ll be cold it’s better to have the extra layers than not. The gloves provided were a bit too big for me, so I didn’t wear them and my hands were a bit cold by the time we paddled back up to the shore. The day was warm enough, so I didn’t bring my own gloves and could have used a light pair like these touch tip gloves that still allow you to use your phone or camera easily. 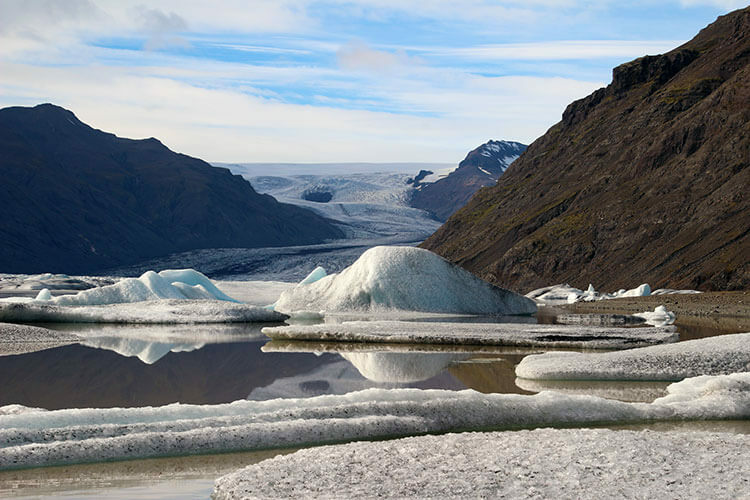 You must meet at the Iceguide Base Camp, which is located 38 kilometers west of Höfn. Use the GPS coordinated 64.259151, -15.587038. 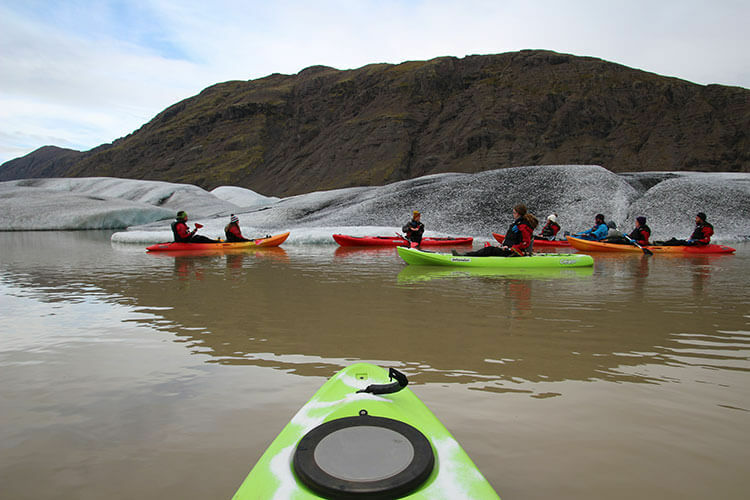 Glacier Kayak Adventure is available June – September twice daily at 9am and 1:30pm. 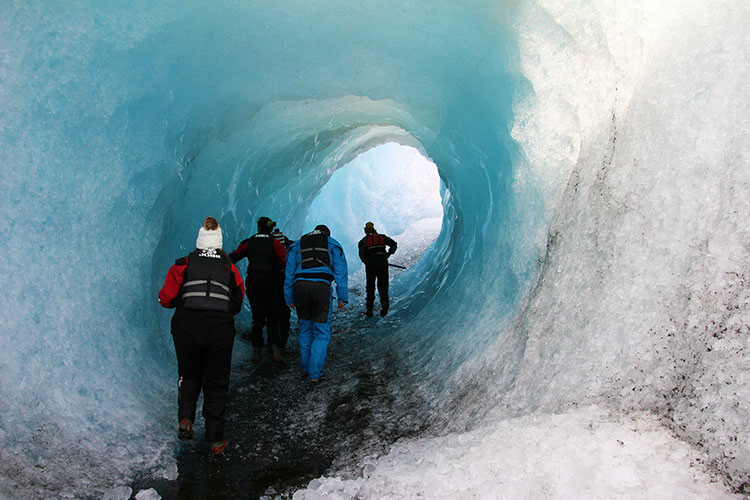 The tour lasts 3 hours, with approximately 2 hours kayaking and exploring an iceberg. Kids must be a minimum of 12 years of age and ride with an adult in a double kayak. 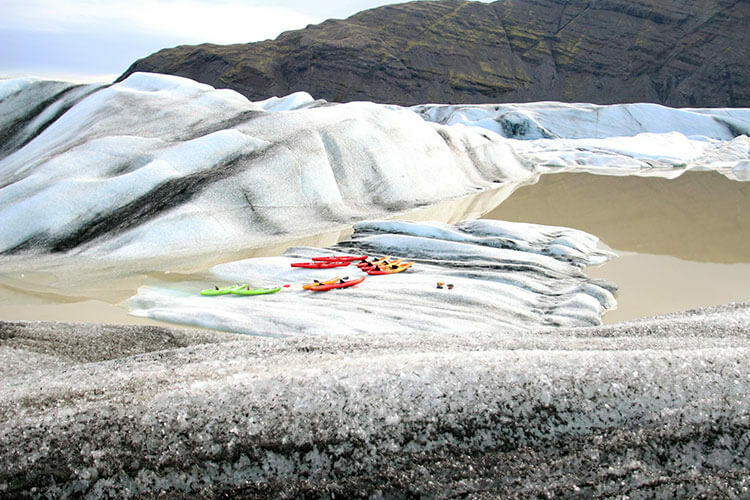 Our Glacier Kayak Adventure was provided by Iceguide in order to bring you this story. However, Luxe Adventure Traveler maintains full editorial control of the content published on this site. As always, all thoughts, opinions, and enthusiasm for travel are entirely our own. This article contains affiliate links. When you purchase anything on Amazon through our affiliate site, we earn a small commission at no additional cost to you. This looks incredible! I am heading to Iceland next year, so I am adding this to my list! WoW!!! I’m about to take a full day kayak tour next week in a very different climate to this amazing Iceland Lagoon. I would love to do this tour, was it a bit weird with the moraine melting so rapidly? Good points in the what to wear section, you certainly do warm up kayaking. No, I was never concerned about the iceberg melting. We were perfectly safe. I very much enjoyed following this trip on Instagram Stories. Kayaking surrounded by those glaciers looked incredible! Once I get to Iceland I know how I’m planning my trip. LYour Iceland information is such a one-stop shop for information on the country. Why, thank you! Adding even more now to our guide after this latest trip. This trip is also good for anyone that hasn’t kayaked before. The conditions are just different, which is also true between ocean kayaking, river kayaking and white water kayaking – all of which we’ve done. The kayaks themselves are very stable. 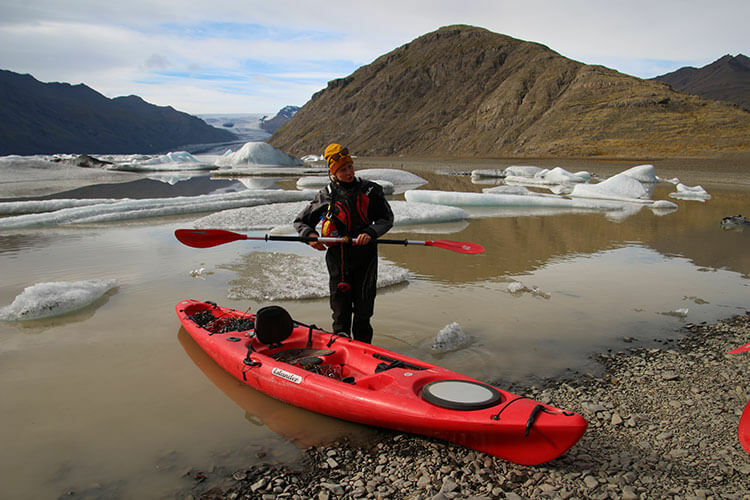 You can’t walk on the glacier or an iceberg without first kayaking to it. But there are hiking trails around and you could get some nice views from higher up of the iceberg lagoon by hiking up. We have glaciers in Tyrol, Austria but the Heinaberg Lagoon glacier is in a class of its own. Can’t think of a better way to explore it than on a kayak. 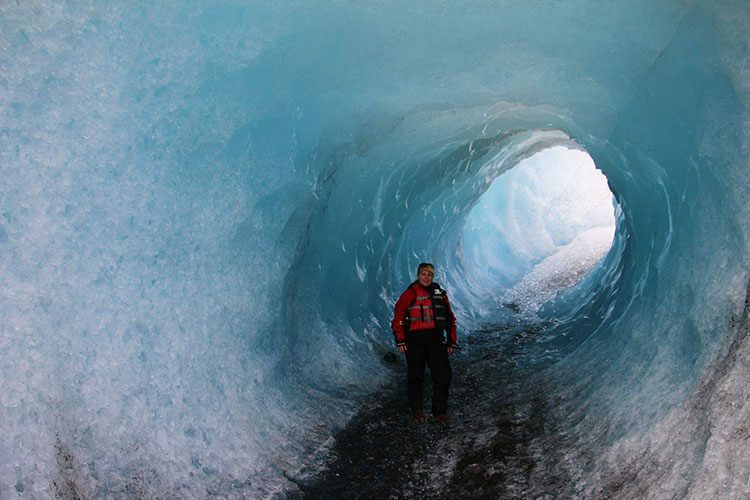 However, I understand why you say the best part is to get out of the kayak and explore the glacier by foot. I would have loved to walk in that moraine. Can’t believe your guide actually made steps for you! Yes, we have glaciers too here in France. But these glaciers in France and Austria do not calve. And not all of the glaciers in Iceland calve. It’s truly something special to see, especially as glaciers all around the world continue to retreat. Wow, this is really cool! I’ve kayaked between icebergs twice in Alaska but didn’t know it’s possible in Iceland these days as well. I’ll remember that for my next visit. Love the pic of the kayaks on top of the ice btw! Did you have the same experience with getting beached on icebergs when you kayaked between them in Alaska? Wow, what a unique experience. It is great to find those spots that overlooked the main tourist trail. I’m a huge fan of kayaking trips, and done them in numerous spots, but have yet to do one next to a glacier. Definitely something I would want to do in Iceland for sure. Kayaking through icebergs looks an amazing experience! I’d never really considered that there would be ice underneath the surface though, and so I imagine it involved a lot more energy than the traditional kayaking downstream of a river! Some fantastic photos there, and great tips on how to best dress for the environment. You’re right, we did stop at Jökulsárlón, but likely in the process zoomed by Heinabergslón Glacier Lagoon! Luckily I fell in love with Iceland and have every intention of returning, so will include a kayaking adventure on our next trip. I can definitely understand why it’s not safe to offer kayaking among the unstable icebergs at Jökulsárlón. So it’s awesome to know that places exisit like Heinabergslón where it is safe. 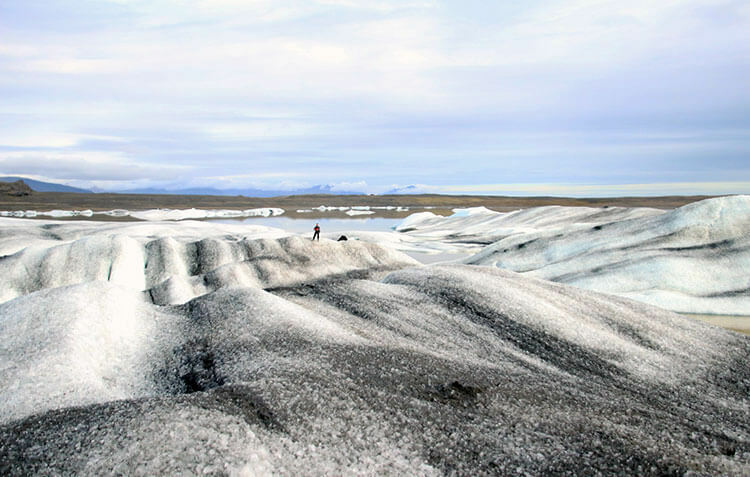 You got so close to the icebergs – and how unbelievable that you got to walk inside the moraine!! Will be adding this to my next Iceland trip!